God Hanuman has an important place in India and is worshipped by millions of people. He is a god who is the archetype of honesty, loyalty and courage. More than any other folk god, Hanuman is endowed with human qualities so much cherished in the Indian tradition. There is no scholarly work in English on Hanuman that utilises Sanskrit literature to delineate his importance as a god and as confidant of Rama. Although Hanuman is a popular folk god in India, he has not received attention commensurate with his popularity from scholars of religion and mythology. This study seeks to fill this gap and explores the human and superhuman role of Hanuman in Sanskrit texts. With the Ramayana as the basic source, Sanskrit plays and Puranas have also been studied to unravel the complexity of Hanuman's personality and its development as a character in flesh and blood. Hanuman is also analysed in the context of religious tradition centred on Ramayana. 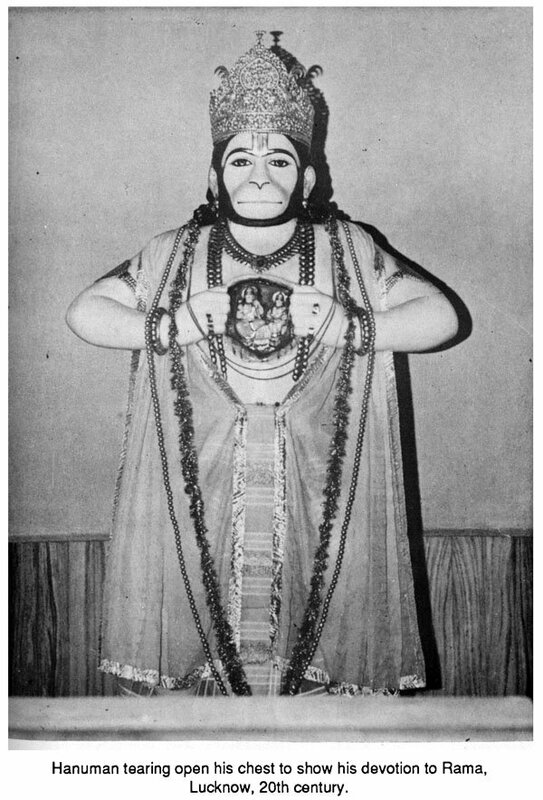 The study focuses on the evolution and change in the theology of Hanuman. He appears as an incarnation of Siva, a god in his own right, a tribal deity and a hero god with power and virility who destroys evil. At a mundane level Hanuman is an ideal human, an upright man, a trusted friend of Rama, a statesman and a brave warrior. In the bhakti tradition, he is the lord, the object of bhakti. Joginder Narula earned her Ph.D. from University of Delhi and did further work at the Center for Religious Studies, University of Toronto. She now lives in Toronto, Canada. This book is the outcome of my Delhi University doctoral thesis on Sanskrit literature on Hanuman in Sanskrit drama, having undergone major changes in style and content. God Hanuman has an important place in present day India and is worshipped regularly by millions of people. However, an analysis of this phenomenon of God Hanuman has been relegated to only a few pages in scholarly works on Indian gods. This study contributes to the understanding of a god who is the archetype of honesty, loyalty and courage. Hanuman, perhaps more than any other folk god, is endowed with human qualities cherished by the Kshatriya and Rajput traditions of India. 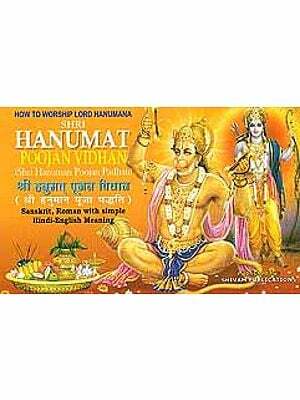 In the book, for the Sanskrit name Hanumana the popular spelling Hanuman is adopted. I would like to thank DR. Satnam Duggal of Delhi University for directing me to the study of Hanuman for my doctoral thesis. I have also learnt much from my post-graduate work at Centre for Religious Studies, University of Toronto. I would also like to acknowledge my gratitude to Bhupinder and Inder Jandoo for making my stay in Toronto both pleasant and fruitful. Hanuman is well known throughout rural and urban India. He is the hero of many folk stories and a popular subject of village plays and dances. His likenesses in stone and wood adore many shrines. His brightly coloured pictures are sold in city streets and hung, on the walls of homes and shops. Shrines of Hanuman are found beneath pipal trees on stone or brick platforms specially constructed to support the image, near cremation grounds and in busy market squares, usually under a tree. His figure often appears in the shrines of Rama and Sita where he is usually represented as a monkey lying at their feet with his tail around them. As a roughly hewn red monkey, he is also installed near shrines of Siva. In the countryside, the shrines dedicated to Hanuman outnumber those dedicated to Rama and Sita. Many of them are located in north India but villages and towns of south India also have significant numbers. In front of Hanuman's image are placed flowers, fruits and other offerings. In North India a sweet called rot is considered the specail food of Hanuman. Hanuman's image is painted ingur (vermillion) or sindur (red ochre). Tuesday and Saturday are special days for his worship when his image is rubbed with oil and sindur. Both oil and red colour are siad to be pleasing to him. Local folklore states that Sita, pleased with Hanuman, offered him a rosary of pearls. 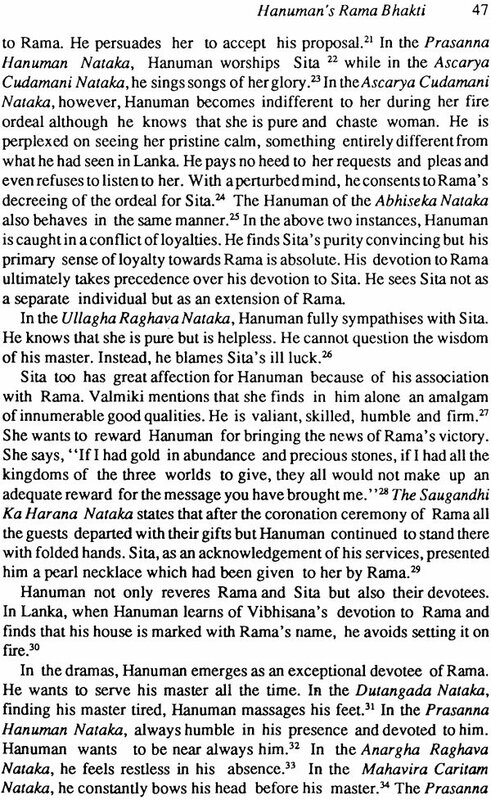 The rosary being without the name of Rama on it, Hanuman felt disappointed. Sensing this Sita, removed some sindur from her forehead and gave it to Hanuman and said, "This sindur is the symbol of my good fortune and luck, it is more precious to me than anything else in this world." It is for this reason, the legend asserts, that Hanuman is rubbed with sindur. K.C. Aryan mentions another folk interpretation of the use of sindur on Hanuman's image. Once Hanuman was severely wounded in a fierce battle. The only thing that could heal his wound was the application of sindur mixed with ghee. In the folk medicine of India, sindur is reputed for its healing properties and is regarded as an effective cure for wounds, cuts and burns. In K.c. Aryan's view, the image of Hanuman annointed with sindur symbolises his heroic and Karamvira (man of action) aspects. Hanuman in his iconographic representations has a monkey face, a human body and a long tail. He is usually shown flying towards the south. His right foot is in an uplifted position, as if in motion and underneath it is a crushed demon. He holds a mace in his right hand a mounatin in his left. On festival days he is clothed and decorated with earrings, necklaces, bracelets and other ornaments. His statue is smeared afresh with sindur as form of worship and devotion. By the late medieval period, Hanuman was established as a brahmacari (celibate). Women in some regions of India avoid touching him. He is also the god of wrestlers and before engaging in wrestling bouts, wrestlers invoke his name for inspiration. Like other Hindu deities, Hanuman has many names signifying divine and human attributes. Some of his names are Mahavira, Mahabali, Bajrangbali, Samkata Mocana, Anjanisuta, Pavanputra, Rudrarupa, Rudravatara, Maruti and Anilatmaja He is usually worshipped as a protector deity and the reliever of evil who keeps away ghosts and spirits. His birthday is celebrated in several parts of India with great enthusiasm. Hanuman's birthday is celebrated on the 15th day of the Hindu lunar month of Chaitra. 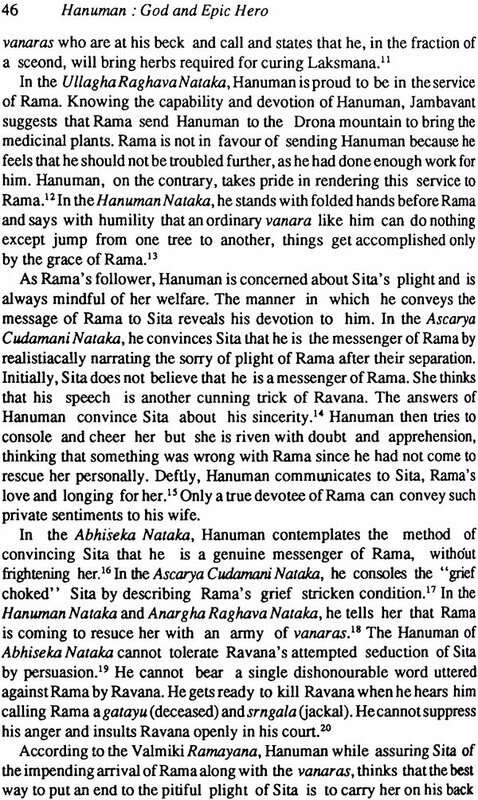 That Hanuman is linked with Visnu through his devotion to Rama is not surprising. Rama is an incarnation of Visnu. The Sri among the Vaisnavas worship Garuda and Hanuman alike as the mount of Visnu. In the 16th century Bangiya Vaisnava scripture of Astavimsati, Hanuman is worshipped in various forms as angadevta. The Tantrikas worship one- headed, five-headed and eleven-headed Hanumans to attain spiritual attainment. The Tantrika texts Narada Purana and Sudarshan Chakraraj Samhita contain elaborate descriptions of various forms of Hanuman worship," Hanuman worship in association with yoni worship in Tantra is worth investigation. Hanuman is generally considered a celibate god. 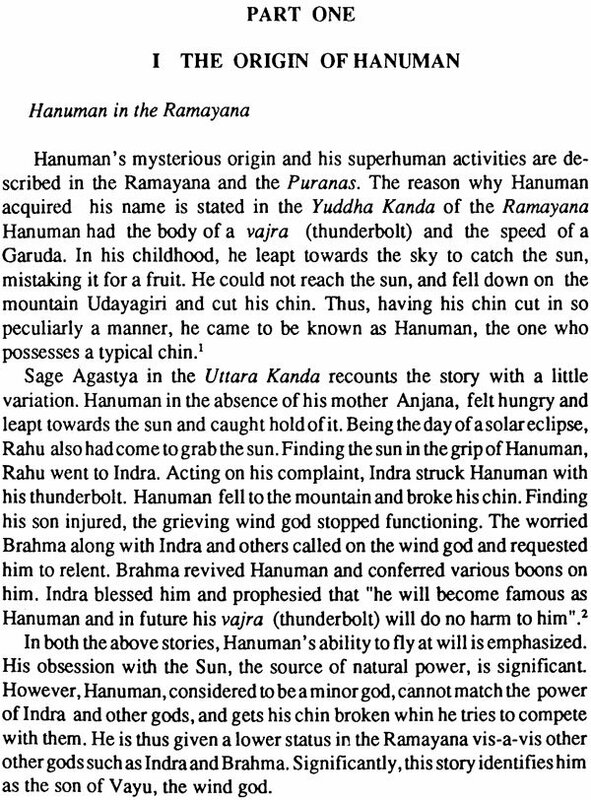 There is no scholarly work in English on Hanuman that utilises Indian literature in Sanskrit to delineate his importance as a god and confident of Rama. Although Hanuman is a popular folk god in India, he has not received attention commensurate with this popularity, from either Indian or Western scholars of religion and mythology. However Hanuman's iconographical development as a god has received attention from Govinda Chandra Rai, G.S.Ghurye, J.N. Banerjee and K.C. Aryan. A historical survey of iconography of Hanuman and his evolution as a folk-god has been undertaken by Govinda Chandra Rai. Camile Bulcke has outlined some of the myths and texts concerning Hanuman. Walcott has written on Hanuman's religious significance in the various beliefs and practices in the folk religion of the Bhojpuri language speaking area of east U.P. and Bihar. Because he lacks the mythological richness and iconographic sophistication of other major Hindu gods such as Siva or Visnu, Hanuman is ignored in major studies of Hindu gods. As a god, Hanuman is too mundane. He is regarded as an earthly god concerned with success and material well- being. For scholars primarily concerned with mysticism and spirituality he is of little interest, for he does not seem to embody other worldliness. He is rarely assigned philosophical attributes as in the Madhva Sampradaya where he is represented as paramjnana, the god of ultimate knowledge. He lacks the sensuous appeal of god Krsna. He rather has an ascetic streak for he is a lifelong celibate. Hanuman makes his initial appearance in the Hindu pantheon during the Puranic period (4th to 9th centuries A.D.). He is considered to be a derivative of Vedic deity Marut (wind god) and is associated with Indra and Vrsakapi. 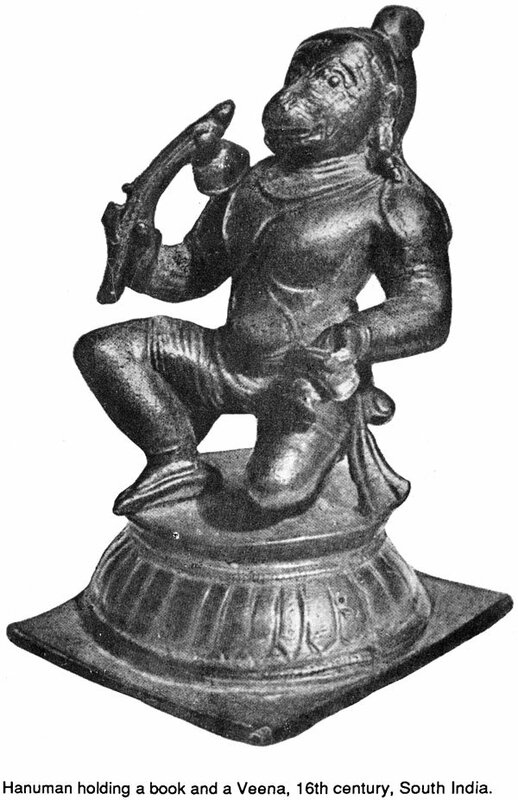 His zoomorphic form suggests that he was originally a god of lower classes or aboriginal communities (possibly of non-Aryan origin), later incorporated into the Brahmanic tradition. There is however a wide-ranging scholarly debate on whether Hanuman is a monkey or a human. 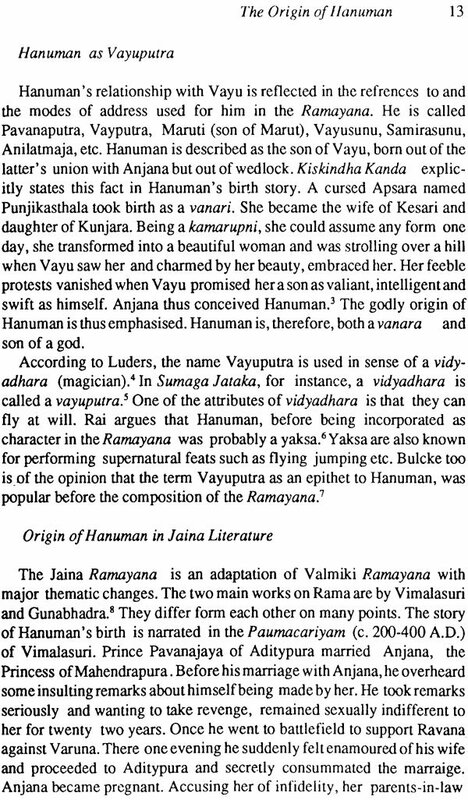 The Ramayana of Valmiki and the Sanskrit play portray Hanuman as a monkey with human, superhuman and godly attributes. However, in modern India he is regarded as a god. This study explores the human and superhuman role of Hanuman in Sanskrit texts. With the Ramayana and its critical editions as the basic sources, Sanskrit plays and Puranas have also been studied to unravel the complexity of Hanuman's personality and its development as a character in flesh and blood. Hanuman is also analysed in the context of religious tradition centred on Ramayana. The study focusses on the evolution and change in the theology of Hanuman. Hanuman appears as an incarnation of Siva, a god in his own right, a tribal deity and a hero god with power and virility who destroys evil. At a mundane level, Hanuman is an ideal human, an upright man, a trusted friend of Rama, a statesman and a brave warrior. In the bhakti (relegious devotion) tradition he is the lord, the object of bhakti.